Navajo crafted, nickel money clip, with a sterling silver top and a 12kt. 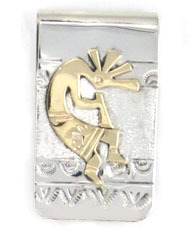 gold-filled kokopelli. Measures approximately 1 3/4" long by 1" wide. Crafted by Roger & Geneieve Jones.